White flour bread dressed with mint leaves, coriander, and jalapeños, baked in tandoor. 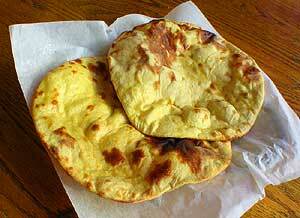 White flour bread baked in tandoor with lots of butter. 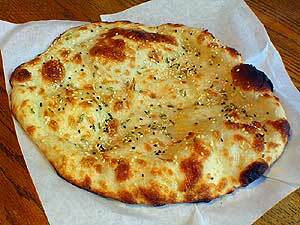 White flour bread garnished with freshly chopped garlic baked in tandoor. 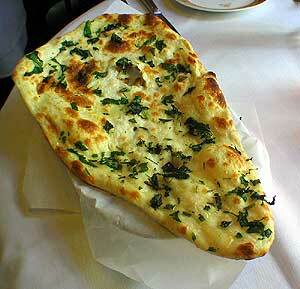 White flour bread garnished with fenugreek herb baked in tandoor. White flour bread garnished with sesame seeds, onion seeds, fennel seeds and poppy seeds. White flour bread stuffed with lightly spiced red onions baked in tandoor. White flour bread stuffed with lightly spiced potatoes baked in tandoor. White flour bread stuffed with lightly spiced cauliflowers baked in tandoor. White flour bread stuffed with spiced home made cottage cheese baked in tandoor. 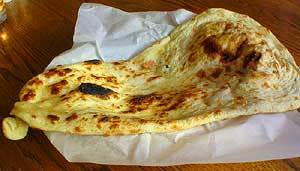 A whole wheat bread, baked in tandoor. 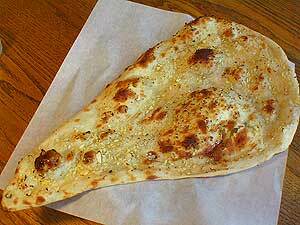 A whole wheat bread, baked in tandoor with butter.